Many investors desire to live off safe and growing dividends during retirement, allowing them to worry less about stock market fluctuations and recessions. To this end, many blue-chip dividend stocks have impressive track records of not only maintaining or growing their payouts during market downturns, but also outperforming the broader market. Dividend aristocrats, S&P 500 companies that have increased their payouts for at least 25 consecutive years, are an appealing place to start looking for recession-proof stocks that can deliver safe and growing income during any economic, interest rate, or stock market environment. In fact, according to data from Simply Safe Dividends and Seeking Alpha contributor Ploutos, an institutional investment manager and CFA charterholder, since 1990 the S&P 500 Dividend Aristocrats Index has outperformed the S&P 500 in each year that the broader market recorded a negative total return. Many dividend aristocrats have conservative management teams, healthy balance sheets, and stable cash flow, helping them fall less during inevitable bear markets and recessions. However, not all dividend aristocrats are created equal. Some cut their dividends during the financial crisis and significantly underperformed the market, while others powered through. Let's take a look at the top 10 recession-proof dividend aristocrats to identify the stocks that appear best positioned to get through the next recession unscathed. The dividend aristocrats analyzed below are ranked in descending order based on their declines during the Great Recession from 2007 through 2009, when the S&P 500 returned a frightening -55%. Each dividend aristocrat here appears to have a safe dividend, backed by a stable business model and healthy payout ratio, a strong balance sheet, and below average stock price volatility. Simply put, these 10 dividend aristocrats can help you sleep better at night during the next economic and market downturn, whenever that proves to be. Founded in 1872, Kimberly-Clark is one of the world's largest consumer staples companies, selling its household name brands in over 175 countries. Kimberly-Clark has been such a reliable dividend growth stock over the past half-century in part due to the recession-proof nature of its business. The firm sells essential products like disposable diapers, training pants, baby wipes, incontinence care products, tissues, toilet paper, and paper towels. No matter what the economy is doing, sales of these products tend to remain relatively stable over time (and grow with the world's population). In fact, the firm's revenue dipped just 4.3% during the last recession. Kimberly-Clark also benefits from its massive size and economies of scale. That allows the firm to spend about $1 billion, or nearly 5% of its annual revenue, on advertising each year, gives its products name recognition with consumers. 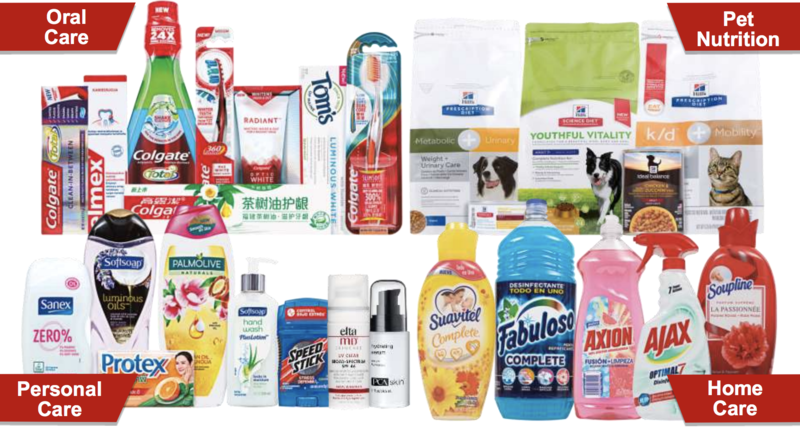 Thanks to its strong branding power (including five mega-brands with over $1 billion in annual sales each), Kimberly-Clark enjoys premium self space with many retailers, including in fast-growing emerging markets such as Asia and Latin America. In fact, Kimberly-Clark's exposure to emerging markets (now over 30% of total sales, up from 14% in 2003) is the key driver for the company and is expected to continue generating mid-single-digit earnings, free cash flow, and dividend growth in the long term. While consumer staples giants have struggled to grow in recent years, driven by demographic trends (e.g. low birth rates in developed markets) and stiff competition from major rivals, private label products, and upstarts leveraging the power of e-commerce, Kimberly-Clark remains a well-run company. In recent years the business has focused on selling or closing down commoditized (i.e. lower margin) product lines to focus on the company's core brands and fastest selling products. In January 2018 Kimberly-Clark announced its largest global restructuring plan in more than 15 years to continue streamlining and simplifying its supply chain and overhead organization. These actions should help the company continue maintaining its profitability in the years ahead, even if top line growth remains sluggish. All told, Kimberly-Clark is a slow but consistently growing consumer staples blue-chip, with a proven track record of dividend safety, growth (46 consecutive years of dividend increases), and outperformance even during severe economic and market downturns. Most oil producers are not great recession proof stocks. These capital-intensive businesses are known for experiencing major swings in their profits and stock prices, driven primarily by the volatile nature of oil & gas prices. However, as one of just three dividend aristocrats in the energy sector, integrated oil giant Exxon Mobil has proven to be an exception to this rule. While the price of oil plunged from a peak of $144 per barrel in July 2008 to under $35 per barrel five months later during the last recession, Exxon's stock only lost 28% while the S&P 500 slumped 55%. Exxon fared well in part because the company's three business units, oil & gas production, refining, and petrochemicals, help smooth out cash flow during periods of low commodity prices (lower oil prices tend to improve refining and chemical margins). More importantly than Exxon's diversified business model is the firm's balance sheet and conservative management. Oil companies need to constantly invest in new growth projects, even during oil crashes, due to the steady production rate declines they experience in older oil fields that ultimately need to be replaced. Therefore, during industry downturns which suppress or even eliminate profits for a period of time, oil companies often need to fund both their dividends and growth capex through debt (which should be paid down during periods of high oil & gas prices). Exxon has the strongest balance sheet (AA+ credit rating) in the energy industry, thanks to its conservative use of leverage, massive asset base, and large stream of integrated cash flow. Even if oil prices crash tomorrow due to a global recession, Exxon would very likely be able to continue funding both its dividend and growth plans due to its respected status with creditors. The other major competitive advantage Exxon has is its proven management team. Over the past decade, for example, the company has reported the strongest returns on capital of any oil major, as well as the smallest amount of write-downs on failed projects or acquisitions. New CEO Darren Woods has an ambitious growth plan that involves ramping up growth spending to $30 billion per year between 2020 and 2025 (compared to $19 billion during the oil crash). Exxon plans to take advantage of the best long-term investment opportunities it has seen "in over 20 years," including in Guyana (offshore oil production), the U.S. Permian Basin (shale boom), Brazil (offshore oil production), Mozambique, and Papua New Guinea (liquified natural gas). All told, Exxon expects that by 2025 it will increase its oil production by 25%, double refining and chemical earnings, triple earnings from oil & gas production, and improve its overall return on invested capital. The most important benefit would be the expected strong growth in its operating cash flow, which is expected to soar by between 105% and 150% if oil prices average between $60 and $80 per barrel over that time. Even if the price of oil remained weak at $40 per barrel, Exxon believes its cash flow would rise 50% by 2025. Thanks to this projected growth, Exxon's dividend should remain safe and rising over time, protecting the firm's dividend aristocrat status. While it’s possible that Exxon’s large spending plans might not work out (cost overruns, project delays, global recession causing another oil crash, a surge in renewable energy adoption), management deserves the benefit of the doubt. With Exxon working to grow its production and free cash flow over the coming years, the firm will likely maintain its reputation for being a reliable income source during future recessions. Johnson & Johnson was founded in 1885 and is the world's largest and most diversified healthcare company, selling pharmaceuticals, medical devices, and over-the-counter consumer healthcare products in over 60 countries. The firm's diversified business model helps smooth out cash flow over time, even when major drugs go off patent and generic or biosimilar competition causes blockbuster drug revenues to fall. Thanks to the recession proof nature of medical sales (healthcare needs remain constant no matter what the economy is doing), Johnson & Johnson's dividend has been able to grow for 56 consecutive years, making it not just a dividend aristocrat but also a dividend king. Johnson & Johnson's consistent growth is made possible by its industry-leading economies of scale (over $80 billion of annual sales). For example, the company spends more than $10 billion per year on research and development, which management expects will result in no less than 10 drug approvals by 2021 that will generate over $1 billion in annual sales each. In its over-the-counter consumer products division, the company has a rich history of innovation as well with over 1,000 U.S. patents. The firm's well-known brands include Neutrogena, Johnson's, and Listerine. The off-patent nature of these products means that they generally cost little for Johnson & Johnson to produce on an industrial scale, providing excellent cash flow each year. And in medical devices, which includes everything from contact lenses to surgical and orthopedic equipment, J&J is similarly a powerhouse with 12 platforms generating over $1 billion in annual sales. These markets are expected to enjoy solid growth as the global population ages. Besides its resilient cash flow stream, leading market positions, and new product innovation, Johnson & Johnson's financial conservatism makes it one of the best dividend aristocrats to own during recessions. The healthcare giant is one of only two U.S. companies to earn a AAA credit rating, providing Johnson & Johnson with financial flexibility to make strategic acquisitions without threatening the safety or growth profile of its dividend. Simply put, J&J is well positioned for the future. Consolidated Edison, or Con Edison, is a regulated utility with nearly 5 million electricity and gas customers in New York, New Jersey, and Pennsylvania. The firm generates over 90% of its profits from regulated businesses which makes for predictable earnings and cash flow. By focusing on regulated utilities, combined with the industry’s slow pace of change and recession-resistant services, Con Edison has built a very durable business that has been solving the same problem for customers since its founding in 1884. As a testament of its predictable fundamentals, Con Edison has managed to grow its dividend for 44 straight years. Like most utilities and dividend aristocrats, Con Edison has relatively low stock price volatility as well. In fact, ED shares only lost 26% while the S&P 500 fell 55% during the Great Recession. Besides its regulated operations, part of Con Edison's resiliency is attributable to the firm's strong balance sheet, which earns a BBB+ investment grade credit rating from S&P. This allows the utility to access low-cost growth capital with which to fund its expansion activities over time. Much of the company's future growth will come from its smaller Clean Energy Business and Con Edison Transmission segments, which are focused on renewable energy and improved electrical distribution infrastructure (including smart grid technology). These businesses represent less than 10% of earnings today but have long-term contracts with investment grade customers (including other utilities) that also generate stable cash flow. Regulators are keen on shifting the company's customer base towards greater energy efficiency and renewable power over time. Con Edison expects these secular trends to eventually result in as much as 15% of its total earnings come from these faster-growing segments. Con Edison is already the second-largest solar energy producer in North America, so the utility appears to have some valuable assets it can use to deliver a cleaner energy future. While Con Edison is never going to be a fast-growing company, due to the steady but slow-growing nature of the regulated utility business model, renewable energy and ongoing regulated projects seem likely to continue driving low single-digit earnings and dividend growth going forward. Few companies can match Con Edison's dividend growth record, much less deliver predictable and steadily growing income in all economic environments with such low volatility. Founded in 1913 making just one product, bleach, Clorox has grown into one of the world's leaders in cleaning products, which it sells in over 100 countries. The company has diversified into other consumer staples categories as well. Its strongest brands include: Clorox, Pine-Sol (household cleaner), Glad (plastic wrap, trash bags), Kingsford (charcoal for grilling), Hidden Valley (salad dressing), Brita (water filters), and Burt’s Bees (skin care). Like most U.S. consumer staples giants Clorox is betting big on overseas growth in emerging markets (50% of international sales are in Latin America) to drive its long-term earnings and dividend growth. Thanks to investing around 12% of its revenue each year in new product development and advertising (average of about $700 million per year), the firm's brands enjoy dominant market share. 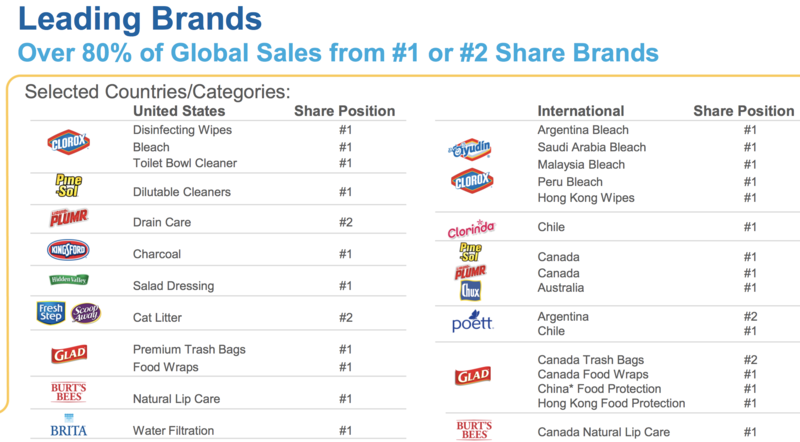 In fact, over 80% of Clorox's global sales are from brands with No. 1 or No. 2 market share positions. Management's focus on mid-sized product categories also helps it avoid going head-to-head with some of the industry's giants such as Procter & Gamble (PG). Going forward, Clorox's plans to continue investing in new products and making strategic acquisitions to expand its portfolio into growing categories, such as vitamins and supplements. With a large marketing budget and global distribution networks, the company can quickly expand new products to markets around the world. Management's Growth 2020 strategy calls for aggressively investing in Clorox's strongest and fastest growing brands, including more targeted digital advertising to grow its e-commerce sales. Ultimately, management expects its strategy to result in 3% to 5% annual organic sales growth and continuous margin improvement thanks to cost-cutting initiatives. If successful, Clorox has potential to deliver long-term dividend growth of about 5% to 8%, about in line with its long-term average. Combined with the defensive nature of its products (the firm's sales dipped just 4% during the financial crisis) and low stock price volatility (CLX shares outperformed the S&P 500 by more than 30% during the financial crisis), Clorox is one of the best recession proof dividend aristocrats. Colgate was founded in 1806 and is one of the world's largest consumer staples companies. Over the course of more than two centuries, the firm has built up an enormous portfolio of name-brand toothpastes and mouthwashes, as well as pet foods, cleaning supplies, and other recession-proof product lines. Colgate sells its products in over 200 countries, with sales balanced between developed and emerging markets. Similar to other successful consumer staples companies, Colgate invests heavily in new product development and marketing activities, which together consume about 12% of the firm's revenue. Colgate tailors its new products and advertising campaigns to local tastes, with a strong focus on earning the trust of dentists and veterinarians who then recommend its brands to end consumers. Thanks to these efforts, plus the company's longstanding presence in the marketplace, Colgate commands over 40% share of the global toothpaste market, about three times that of its nearest rival. And in many of the world's fastest-growing economies, including India, Brazil, and Mexico, Colgate's market share ranges from 50% to over 80%. Not surprisingly, the company has operated in these countries for decades, entering Mexico in 1925, Brazil in 1927, and India in 1937. Consumers continue purchasing Colgate's essential products even when times are tough. During the Great Recession, Colgate's sales edged lower by just 2.6%, for example. The business continued generating excellent free cash flow as well thanks to its mature state and established brands. Thanks to these qualities, plus management's general conservatism, Colgate has paid uninterrupted dividends since 1895 and raised its annual payout 55 consecutive times. With mid-single-digit dividend growth potential going forward and low stock price volatility (during the financial crisis CL shares fell 22% while the S&P 500 plunged 55%), Colgate appears to be one of the best recession proof aristocrats. Hormel is one of the best recession proof aristocrats due in part to its outstanding dividend track record. Specifically, the company has paid uninterrupted dividends since 1928 while increasing its payout for 52 consecutive years. Like many companies on this list, Hormel is a very established (founded in 1891) consumer staples company, specializing in recession-proof high protein foods it sells under well-known brands including Skippy peanut butter, SPAM meat, Dinty Moore stew, Muscle Milk protein drinks, Wholly Guacamole dips, Jennie-O turkey, and various Hormel-branded meat products. Impressively, Hormel's brands command No. 1 or No. 2 market share in over 40 of its product categories, which collectively account for 60% of sales. Consumers know and trust Hormel's products since many of its brands have existed for decades (SPAM and Dinty Moore were conceived in the 1930s) and benefited from billions of dollars of advertising spending over the years. In recent years, many large-cap packaged food companies have struggled to achieve profitable organic growth due to consumers' growing preference for healthier offerings, causing them to purchase fewer foods found in the center of the store. Some of Hormel's brands have felt the slowdown as well, but most of its portfolio is focused on meats which continue enjoying solid demand. Hormel's management also continues expanding the firm's portfolio of brands to include healthier and more popular product lines that are expected to generate stronger growth in the future. Examples include Hormel's $700 million acquisition of Skippy Peanut Butter in 2013, the firm's $450 million purchase of Muscle Milk in 2014, and its $850 million deal for Columbus premium deli meats in 2017. Yet despite a steady stream of acquisitions over the years, Hormel's balance sheet remains pristine, with a very strong A credit rating from S&P. In other words, the business has ample financial flexibility to continue buying new "on trend" brands in the future. Hormel's strategy, and the recession-resistant nature of its products, have helped the business achieve positive earnings growth in 28 of the last 32 years. The firm's sales fell less than 4% during the Great Recession, and its stock declined just 15% while the S&P 500 lost 55%. Going forward, Hormel will continue expanding its presence in emerging markets such as China and Latin America while making additional bolt-on acquisitions and developing new products. If successful, Hormel's top line has potential to grow at a mid-single-digit pace, with its earnings and dividend growing somewhat faster. Hormel's outstanding track record and bright long-term future make it one of the most fundamentally strong dividend aristocrats. Founded in 1889, McCormick is the world's largest name in spices, condiments, and sauces with over 16,000 products. The firm sells its offerings under the McCormick, French's, Frank's RedHot, Lawry’s, Club House, Zatarain’s, Thai Kitchen, and Simply Asia brands in over 150 countries. McCormick's global market share is about four times that of its nearest competitor, and in total it controls about 20% of the global spice market. With many of its products in constant demand regardless of economic conditions (people still need to eat, and cooking at home is an affordable option when times get tough), the firm generates predictable cash flow and resilient sales. In fact, during the financial crisis McCormick's sales actually grew 0.5%, helping its stock outperform the S&P 500 by more than 40%. This predictable aristocrat has increased its dividend for more than 30 consecutive years, and its outlook for continued growth remains bright. Going forward, McCormick's strongest growth is expected to come from emerging markets, which represent roughly 20% its business. As the middle class population continues expanding, more consumers can afford spices and seasonings. Management's long-term guidance call for 4% to 6% annual revenue growth and 9% to 11% earnings and free cash flow growth. Organic growth (investing in its strongest brands), acquisitions, and ongoing margin expansion (cost cutting and increased economies of scale) are the key drivers. However, McCormick's long-term growth isn't dependent on acquisitions. Most of the firm's brands are "on trend" with changing consumer tastes. The company has 20 R&D labs around the world cooking up innovative new flavors over time and recognized the growing popularity of organic products early on (75% of its spices are now organic). With about 7% of sales going to new product development and marketing each year, McCormick appears to have the resources to defend its industry-leading brand and pricing power. If management delivers on its guidance, then this dividend aristocrat has potential to deliver double-digit dividend growth over the coming years, even during downturns. That makes the global spice and seasonings king an especially attractive recession proof aristocrat to consider. McDonald's was founded in 1940 and is the world's largest quick service restaurant chain with over 37,000 stores in more than 100 countries. Over 90% of McDonald's restaurants worldwide are franchised, meaning the stores are owned and operated by independent business owners. Under a typical franchise arrangement, McDonald's owns the land and building or secures a long-term lease for the restaurant location, and the franchisee pays for equipment, signs, seating, and décor. Ownership of real estate, combined with co-investment in the properties by franchisees, enables McDonald's to achieve excellent restaurant performance levels. McDonald's success in the fast food industry is driven by the company's focus on convenience, consistency, and value, all tied together by its successful and unique franchising model. "We (McDonald's) are not technically in the food business. We are in the real estate business. The only reason we sell fifteen-cent hamburgers is because they are the greatest producer of revenue, from which our tenants can pay us our rent." McDonald's is one of the largest real estate owners in the world, having snapped up thousands of property locations worldwide along highways and within busy cities over the course of many decades. However, rather than operate capital-intensive restaurants itself, McDonald's locations are essentially financed by independent operators (the franchisees), who pay an upfront fee to open a restaurant and send as much as 16% of their restaurant sales back to McDonald's for rent under their long-term lease agreements, according to The Wall Street Journal. While this business model is quite lucrative (McDonald's operating margin exceeds 40%), the company's relationship with franchisees is far from one-sided. Co-investing in property improvements and collecting a reasonable percentage of sales rather than forcing franchisees to buy overpriced supplies from the company are just two examples of how McDonald's works alongside its franchisees. As a result, McDonald's does a great job maintaining consistency across its locations owned and operated by independent business owners. Not surprisingly, McDonald's has focused on re-franchising more of its company-owned stores, aiming to have at least 95% of its locations run by franchisees (up from 81% in 2015). This model is far less capital intensive and generates recurring, high-margin cash flow in the form of franchise fees and rent payments. If successful, McDonald's dividend should continue at a high single-digit rate, easily extending its 42-year dividend growth streak. As McDonald's business model continues evolving towards a higher-margin model its recession performance has potential to improve as well. That's saying a lot given that during the Great Recession McDonald's stock fell just 3% while the S&P 500 plunged 55%. The company's sales also declined less than 7%, making McDonald's one of the top dividend aristocrats to own during recessions. Founded in 1940, Walmart is the world's largest retailer (and the largest U.S. grocer) with over $500 billion in annual revenue and more than 11,000 global stores that serve 270 million customers each week. Walmart's long-term success stems from its focus on convenience and making good on its "everyday low price" guarantee. Over 90% of the U.S. population is located within 10 miles of a Walmart store, for example. Meanwhile, Walmart exerts substantial pricing power over its suppliers given its sheer size, keeping prices low for customers. However, consumer spending habits are changing, with more purchases being made online. Walmart's business model is adapting by focusing on an omnichannel strategy. In 2016 the retailer acquired Jet.com for $3 billion and let its CEO run Walmart's online business. Thanks to quick growth in this business, additional bolt-on acquisitions, and the firm's ability to leverage its massive physical footprint as a distribution hub, Walmart expects online sales to reach 15% of its total revenue by 2022. While Walmart's business is evolving, the company remains a solid bet during economic downturns. Impressively, Walmart is the only dividend aristocrat to have delivered a positive total return while the S&P 500 lost 55% in the Great Recession. The company's sales also inched higher, rising 0.1%. Groceries account for around half of Walmart's U.S. sales and are in constant demand, explaining some of the firm's strong recession results. Low-priced products, including private label merchandise, are also popular during recessions, playing to Walmart's value-focused approach. With that said, investors considering Walmart should note that the retailer's dividend growth prospects appear weak. While online sales are growing, they carry lower margins and require substantial investments. Walmart also faces upward pressure on the wages it pays its employees, which could further pressure its profitability. Overall, Walmart remains one of the most defensive and recession proof dividend aristocrats, but the firm seems unlikely to raise its dividend by more than around 2% per year going forward. The dividend aristocrats reviewed here have delivered impressive performance over the long term, including during the Great Recession. While no one can predict what will cause the next recession, each of these businesses continues to possess qualities that suggest they will hold up relatively well compared to the broader market. From conservative management teams, to stable business models, strong balance sheets, and reasonable payout ratios, these recession-resistant dividend aristocrats have what it takes to earn high Dividend Safety Scores and likely continue delivering growing dividends no matter what the economy or stock market is doing.